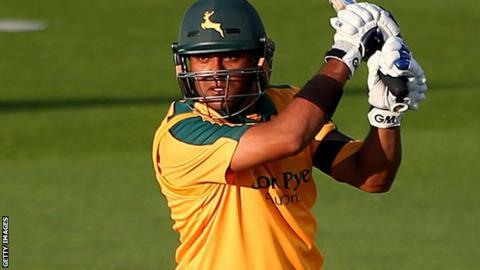 Samit Patel and James Taylor shared an unbroken 215-run partnership as Nottinghamshire beat Essex by seven wickets in the One-Day Cup. The England internationals guided the visitors to a target of 269 with eight balls remaining at Chelmsford. Victory maintained Nottinghamshire's unbeaten run and strengthened their position at the top of Group B.
Jesse Ryder earlier survived being dropped three times to finish unbeaten on 81 in Essex's under par 268-8. Patel and Taylor came together with Nottinghamshire under pressure at 56-3 having lost the wickets of Alex Hales and Brendan Taylor in quick succession. But, the pair plundered a weakened Essex bowling attack with Patel reaching three figures in 96 balls. Only David Masters caused the visitors any real problems with 2-28. But after he completed his allotted 10 overs early, captain Ryan ten Doeschate was left with few options to counter Patel and Taylor. Samit Patel's century against Essex was his fourth in List A cricket and just five shy of his highest score of 129 not out against Warwickshire in June 2013. "They (Patel and Taylor) are batsmen who can adapt to all forms of cricket and they confirmed just what good players they are. "They didn't panic after we lost those three early wickets and displayed a range of strokes to go with their ability." "We did all we could to find a way to end their partnership, but they batted superbly and showed their class. "We've now lost two matches in succession and need to get back to winning ways soon if we are to reach the quarter-finals."